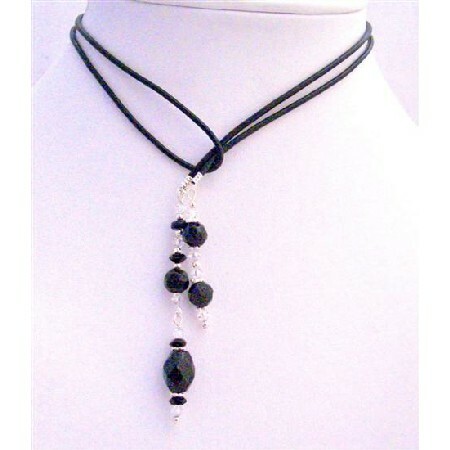 Worn in so many ways this classy lariat necklace has Swarovski Onyx Jet Barrelle 8mm round crystals with 4mm bicone crystals with bali silver spacer accented genuine leather cord attached to both ends. Tie it & layer it long or short! Hangs beautiful. This is such a Beautiful & vermil with Excellent quality. Perfect with any outfit Superr Grade RARE HIGHEST QUALITY. Good shinning surface quality with unique attractiveness & fashionable flair to this stylish. What is in this season? Check this out! Necklace a trendy Necklace a perfect piece for anyone to wear for a formal or casual occasion!.